Here’s a band made of solid musicians that are on the scene for quite a while now and have quite a few albums under their belt with that combo but also many others. Hipbone Slim was formerly known as Sir Bald Diddley (and also the bald Bomber). Bruce Brand is a cult figure, having played drums with Ronnie Dawson, Link Wray, the Milshakes, the Headcoats, the Masonics and the list goes on. Their bassist is Gez Gerard (The Kneejerk Reactions) and they even have Slim Cyder (Blueberry Hillbillies) to guest on piano on two tracks. With such a band the least you can expect is to hear some real and unadulterated Rock’n’roll and believe me you won’t be disapointed. Tombstone Rock is a wild rock’n’roll with a hint of psychobilly garage (does that exist ?) with Bruce Brand pounding the drums like no tomorrow and a superb final scream from Hipbone Slim. Pocket Pistol is more classical in its form, but not in its rendition (and don’t believe that classical means “tame”). Excellent Rock’n’roll. It’s one of the two tracks that features Slim (not Hipbone, the other one, on piano). The second track with piano is What is Wrong, a dirty blues with mean guitar. Hipbone has the perfect voice for this kind of stuff. 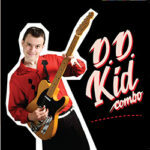 The Ep ends on a high note with Hubabub, a crazy Rockabilly number, close in spirit to what Ray Condo used to do in his Hardrock Goners period. Another killer release from Martin’s Garage. 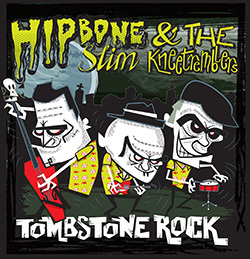 Share the post "Hipbone Slim and the Kneetremblers"